Nigerian singer Tiwa Savage has just rewarded herself with a new car. With no official music from the singer, she has managed to keep the buzz around coming. She made major news after she dropped her cover version for Kizz Daniel’s ‘Fvck You’. The Mavin Records first lady was also dragged by Seyi Shay and Victoria Kimani on the ‘Fvck You Challenge’. Despite the negative publicity the singer has gone on to get herself a new ride. 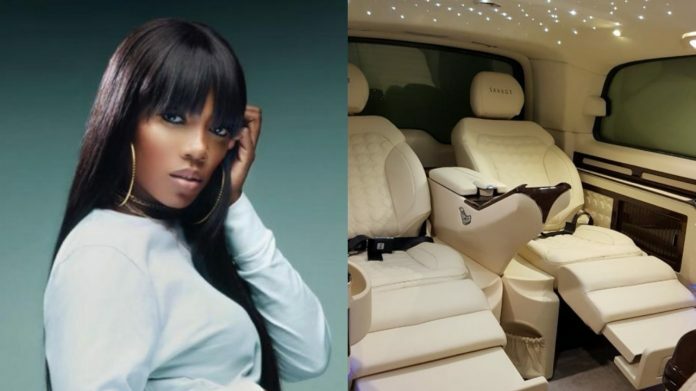 Tiwa Savage who was made a Star Beer ambassador earlier in the year showed off her new customized whip on social media.